On 28th May 2011, the park celebrated its grand opening. I was back at the park a year later, but it was an ordinary day. Unlike other major theme parks, there were no “First Anniversary” events here, but the park recently announced some new attractions. 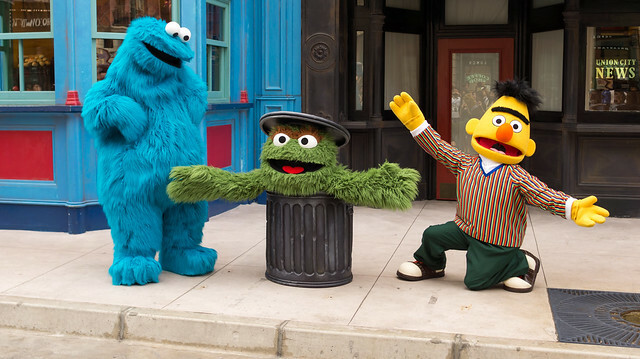 As part of the park’s plan to add more attractions, Sesame Street will be built at the New York zone. This would bring in an indoor ride, street performances and of course, merchandise stores. 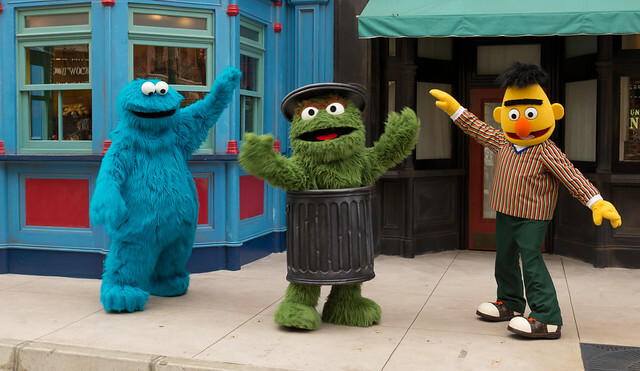 Sesame Street will be rolled out at the park in phases, starting with character meet-and-greet and street performances. These are already part of the park’s daily activities. In a few weeks, character breakfast will be available. Guests will be able to make reservations to dine with Sesame Street characters at Loui’s NY Pizza Parlor. This is obviously an up-charge, and guests will be treated to a breakfast buffet. Specially designed cakes and small pastries, featuring Sesame Street characters, will also be available. In July, new retail stores will be opened around the New York zone. One of them will be themed to the Sesame Street School Bus. Lastly, the park will open an indoor ride where guests follow Elmo and friends around New York. It is expected to open before the end of the year. 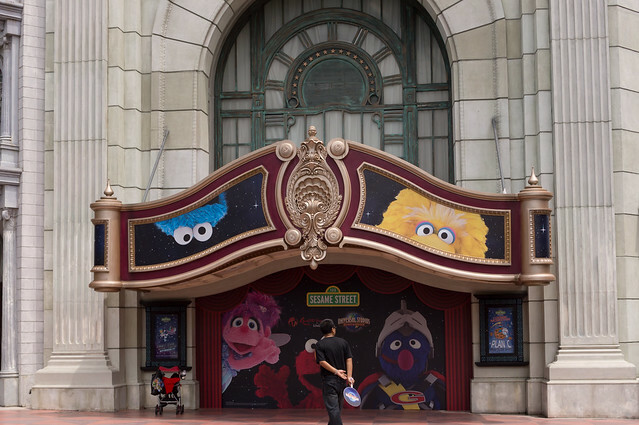 There are two likely locations where the Sesame Street indoor ride will be built. This is one of them – at the “Universal Theatre” at the start of the New York zone. This building façade (actually known as Stage 29) was expected to be the entrance to the Stage 28 attraction. Given that the Sesame Street New York extension is quite… extensive, I believe Stage 28 will no longer be built. Besides, the actual Stage 28 building has been used as a MICE venue (and a scare maze during Halloween Horror Nights) anyway. 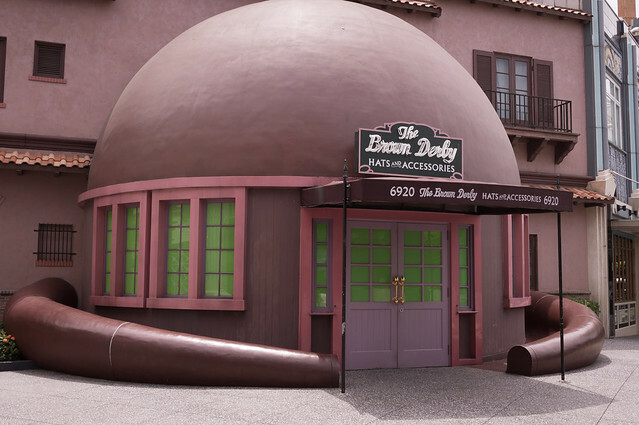 Across the street – Brown Derby has been closed. Is it under refurbishment, or will it be gone? Given that the park intends to build three retail outlets, it is likely that it may become one of them. Character Meet-and-Greet will be held at the New York Library steps. Like the other Meet-and-Greet sessions at the park, these characters will appear at random, or 5-10 minutes after a Sesame Street performance. 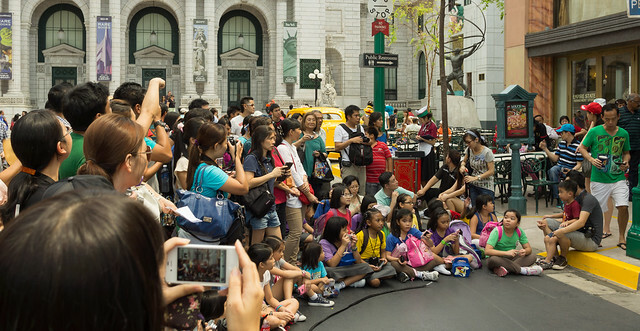 The park promises about 3 to 5 street performances in a day, with 3 shows in the current line-up. Specific schedules can be found on leaflets in the park. Yesterday (28th May), the show times were: 11:00AM, 2:15PM, 4:00PM. Take note that the park schedules do not state which show will be performed. 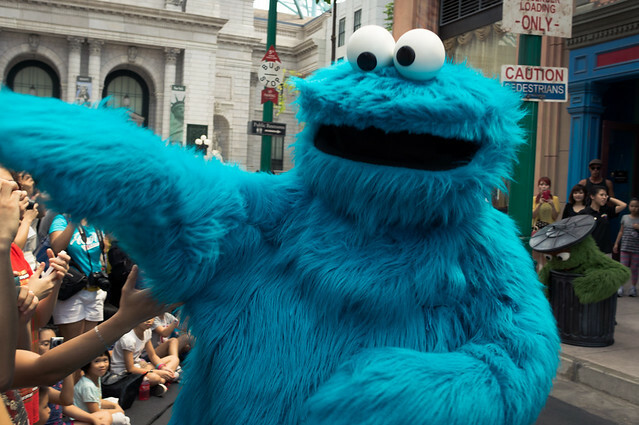 These shows are performed with actors wearing larger-than-muppet costumes. featuring Big Bird, Elmo, Cookie Monster, Bert and Ernie, Grover and Abby Cadabby. This show is performed up to twice daily. This is a longer show (about 12 minutes long). featuring Cookie Monster, Bert and Oscar. These two shorter shows are performed up to three times daily. I stayed for one performance called “Our Favourite Things”. I was half expecting the song from The Sound of Music. Many guests (and RWS staff) gathered around the New York Library, only to see the park crew bringing out a black rope and heading towards the other way. I was quite surprised to see the short rope being laid out in a small arc on the street. In a few moments, the usual music at New York gave way to a few Sesame Street themes. The characters enter the park through a door at the Rockefeller Center façade. I’m amused to see children that are more interested in taking photos and videos, instead of actually watching the performance. This performance is a short one – about 6 minutes. The characters basically introduced themselves (and their favourite things) and then break into song. There aren’t actually any interaction between the characters and audience apart from the usual greetings due to the nature of how the performances are actually, “performed” – movements synced to a pre-recorded track. After the performance, guests were instructed to walk over to the New York Library for Photo Opportunities. I’ll just be honest. I was first shocked when news about this zone leaked out last year. Frankly, after hearing that Universal Studios Japan will be building The Wizarding World of Harry Potter, this almost seems like a slap in the face for Universal Studios Singapore. 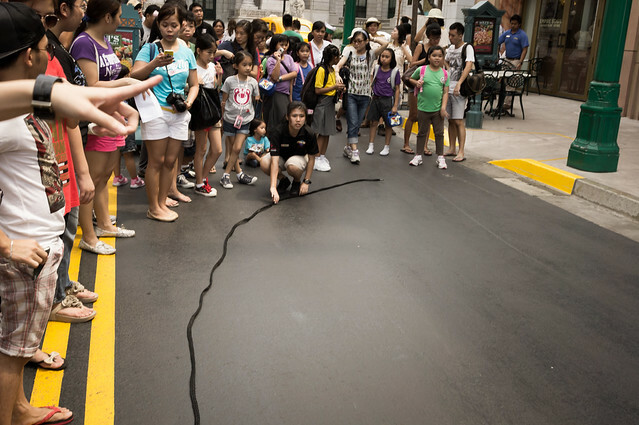 Is the Singapore park is not adequate enough to receive what is to becoming the “signature zone” of Universal Parks? 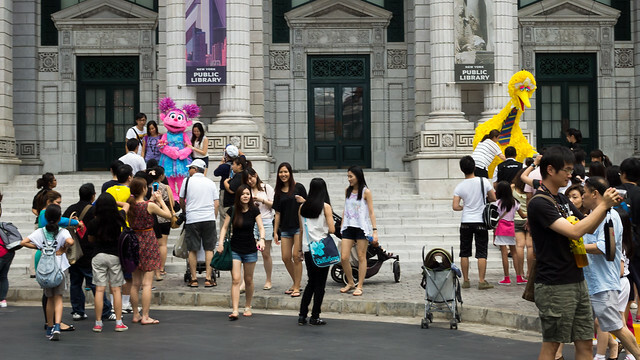 With Sesame Street, the park will have 3 out of 7 zones to be specifically “family-friendly”. Let’s not forget that each zone has 1 or 2 “family-friendly” rides. This park is starting to look too… friendly. But it seems that the park loves this idea and has the new stuff planned out properly. There are long queues for character meet-and-greet. Maybe park guests do love Sesame Street – I’m not sure about that for myself. While it is expected to be an indoor ride geared towards children, I hope the park does not intend to skimp and construct yet another technically simple ride. We’ve seen the unsatisfactory feeling from guests disembarking from Madagascar: A Crate Adventure and Treasure Hunters. In order to avoid another “Madagascar” situation (where guests ride it once and never want to step in again), the Sesame Street ride has to offer something apart from a typical sightseeing ride that this park has an abundance of. A family-friendly (I’m tired of using this term but it’s most suitable) ride does not need the adrenaline-pumping movements of a high speed ride, but should use modern ride to build exciting and memorable guest experiences. There are several successful rides around the world. 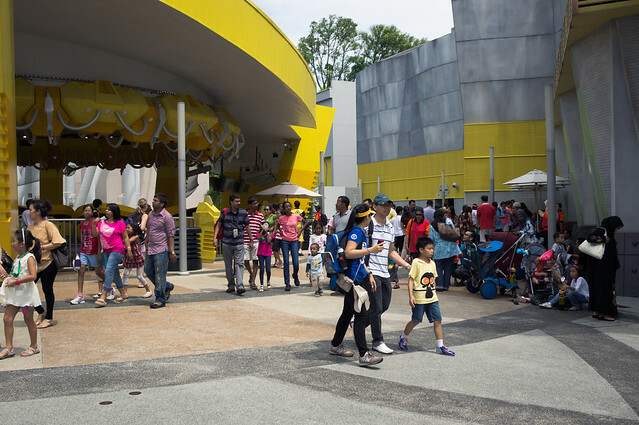 Put in interactive elements (e.g: Men in Black: Alien Attack, Monster’s Inc: Ride and Go Seek, Buzz Lightyear’s Astro Blasters, Toy Story Midway Mania) or unconventional scene/ride movement (e.g: Pooh’s Hunny Hunt) to ensure the guests – of all ages – would want to step into the queue again. And of course, decent Animatronics – definitely not the ones used in Madagascar: A Crate Adventure. 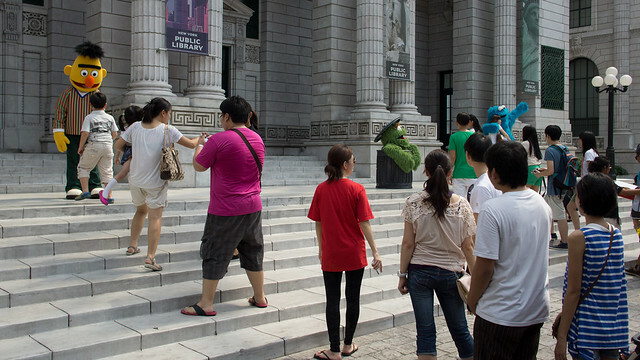 It is the June Holiday season again, so expect the park to be crowded. On 28th May, the wait-time for most E-Ticket rides (Transformers, Battlestar Galactica, Jurassic Park Rapids Adventure) hovered around 40-45 minutes. Revenge of the Mummy peaked at around 35 minutes. 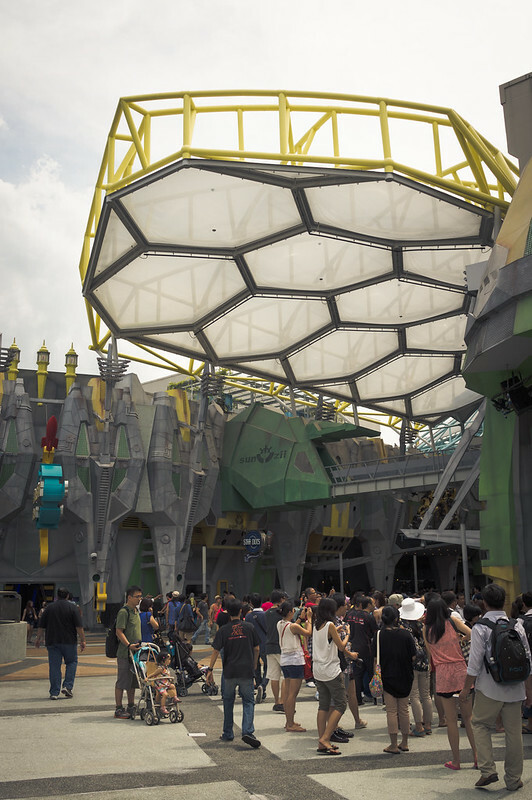 Expect longer waits at Canopy Flyer – the wait time remained steady at 45 minutes in the afternoon. Even with such crowd levels, it is still possible to hit all the attractions within a day with proper planning, or making use of the Singer Rider line. Be sure to ask at the ride entrances of Transformers, Battlestar Galactica, Jurassic Park Rapids Adventure and Canopy Flyer. Alternatively, invest in Universal Express passes if you do not wish to break away from your group. Most importantly, do plan to have your meals early as the park restaurants get filled up very quickly during lunch. One of many people recording the Sesame Street Performances. 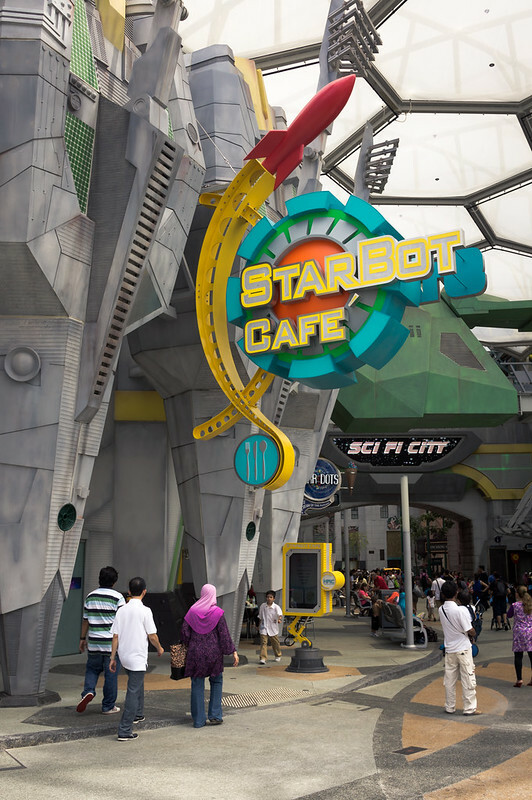 Starbot Cafe has an attractive new signage. 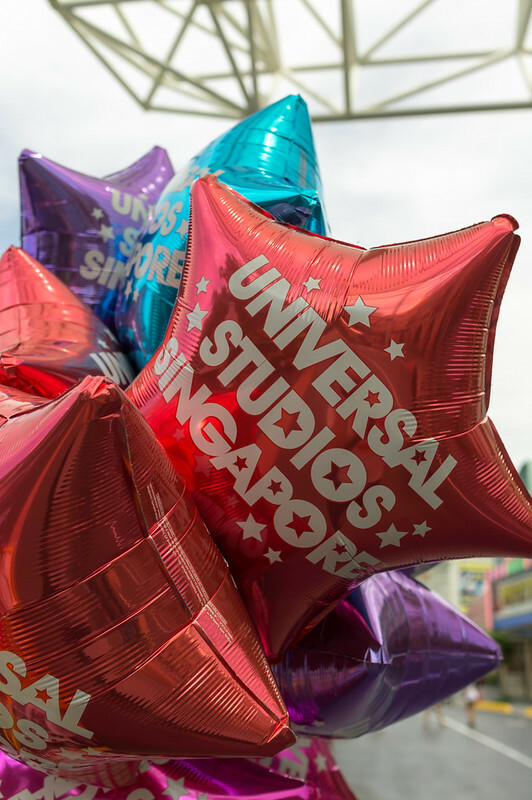 The star-shaped balloons now have ‘Universal Studios Singapore’ printed on them. I actually like the idea of having a Sesame Street ride. But just as you have said, the ride needs to be innovative in order to be memorable. I hope the attraction will surprise me! I hope to be surprised (pleasantly!) too. If it’s anything like Disney’s “Family” E-Ticket attractions, I’m sure everyone will be pleased. I agree wholeheartedly about USS’s several mediocre rides. A lack of imagination is one thing, but I don’t think USS had/has done enough research on the demographics of park visitors. I’m a frequent visitor and there are far more grown-ups in the park than families with kids, and more than enough thrill-seekers looking for some adrenaline kick. 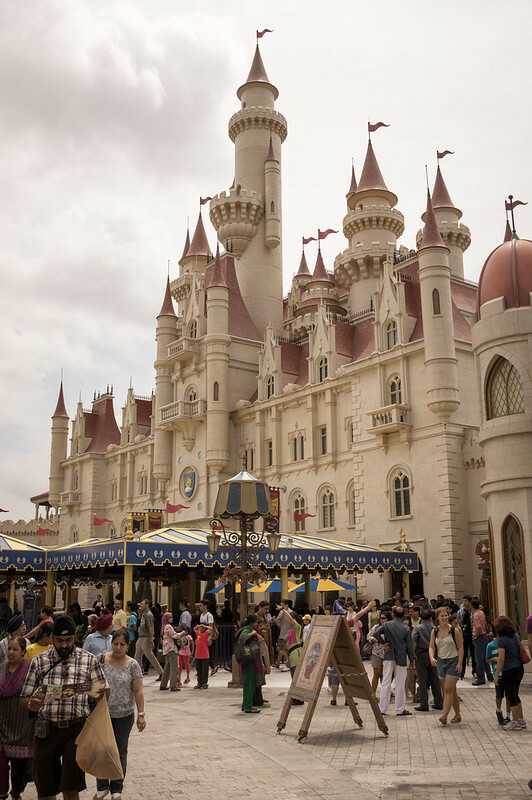 There is simply not enough thrilling and creative rides to cater to them, and certainly not justify the hefty entrance fees for a park filled with some rides that seem more appropriate in a rundown amusement park. I agree with your sentiments. I’ve always seen young children rushing into the queues for Battlestar Galactica – they’ve barely met the height requirements! 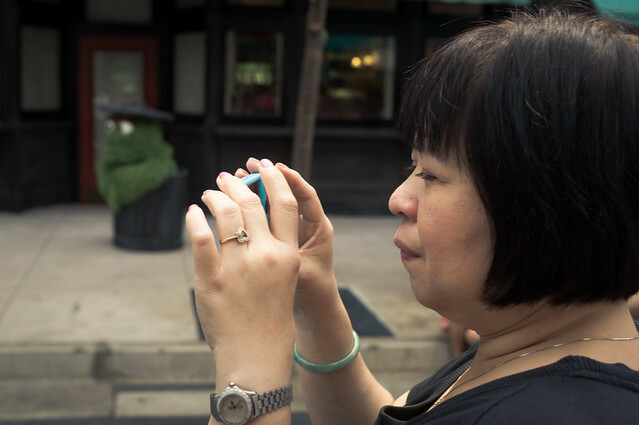 The park does not even need to commission research on park visitors. On most off-peak days, the stretch from Madagascar to Far Far Away becomes dead-quiet in the afternoon. There is hardly anyone going on the rides. Unlike the roller-coasters in the park, Jurassic Park Rapids Adventure and Transformers, the rides in those two zones don’t warrant a second experience. Like what you’ve said about more grown-ups in the park: It is the Jurassic Park – Ancient Egypt – Sci-Fi City zones that are packed with people. Personally, I’m hoping that the park realizes the long-term issues with the Dreamworks zones and remove them in favour for The Wizarding World of Harry Potter. Great update. Totally agree on Madagascar – what a disappointment! It was a clear rip off HKDL’s It’s a Small World, with less sense and less artistic value. It could have been so much more! Hopefully the Sesame Street ride will have be more innovative, like Transformers, and have some value for captive parents and teens, too. I understand what you mean. Even young children are hard to impress nowadays. i can’t wait for the sesame street zone to open!!!!! I tend to avoid the Madagascar/Shrek zones whenever I’m in the park and only just pass through them to get to other areas. Have never been into the Madagascar ride and don’t think I ever will. The Shrek attractions are OK the first time, but not for repeats. I also have the same wish. It’s up to the park to do this and they might be forced to do it to stay up to date with the other Universal Parks. However, it’ll be a long time before it happens because the park has only opened for 2 years – and Wizarding World of Harry Potter is like a “lifesaver” for parks that have gone past its peak.